The CIA and Gina Haspel loom as an obstacle to President Trump’s Saudi rescue mission. The White House wants to exonerate Crown Prince Mohammed bin Salman from the assassination of journalist Jamal Khashoggi . This is not only because MbS has a tender filial bond with Jared Kushner, but also because the president and his cabinet want to resume a “normal” relationship with Saudi Arabia. In this context normal means multibillion dollar oil and arms transactions, and business as usual with the Saudi intelligence corps, the General Intelligence Presidency. 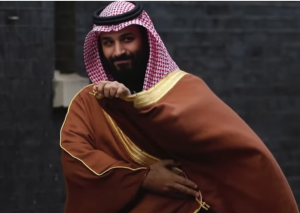 The notorious MbS is key to the resurgent Washington fever dream of “regime change” in Iran. The administration’s current plan, supported by Raytheon, seems to be pursuit of a proxy war against Iran, using Israel’s Mossad and the Saudi GIP as undercover allies. Director Gina Haspel stands in the way, not by choice. She and her staff have concluded that the evidence–including an audio tape intercepted by Turkey or the American NSA–points to an inconvenient truth: that MbS ordered the operation that ended with the strangling and dismemberment of Khashoggi, a royal insider turned critic. Senior Saudi intelligence officers were probably involved. Naturally, Sen. Bob Corker, chairman of the Senate Foreign Relations Committee, wants Haspel to come along when Secretary James Mattis and Secretary of State Mike Pompeo brief Senators on Wednesday. Naturally, the White House doesn’t seem in any hurry to include Haspel. By their public statements Pompeo and Mattis seem prepared to whitewash the Khashoggi killing for the sake of the policy status quo. Will Haspel go along? If she wants to keep her job, she won’t go to Capitol Hill at all. If she testifies and says what she reportedly believes, the Trump MbS coverup will continue to fall apart.